Right now you are probably thinking, "What?! That's not how it goes! Is this some kind of bad satire?" But actually those are the original lyrics to one of our most popular Christmas songs of all times. 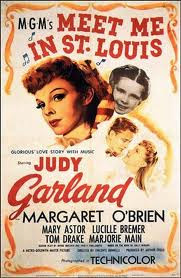 "Have Yourself a Merry Little Christmas" was originally sung by Judy Garland in the 1944 MGM musical "Meet Me in St. Louis." However, when presented with these lyrics, Garland, her co-star Tom Drake and director Vincente Minnelli criticized the song as depressing - especially since Garland's character was supposed to sing this song to "cheer up" her 5-year old on-screen sister! The songwriter, Hugh Martin, eventually agreed to make some changes and it started to appear more like the song we know now. The song was revised again for Frank Sinatra in 1957 where Martin made several changes so that the song became more of a celebration of the present rather than the hope for a better future. While the version written for Sinatra is more popular, both versions have been covered by artists and performed to the current day. For the most part, I like the revisions except for one. In 2002, Newsong lead singer Michael O'Brien noted the line "through the years, we all will be together if the Lord allows," which was part of the original song, was purged and replaced with "if the fates allow" to remove religious reference when the song was released. He noted while a pastor in a California church in 1990, he had met Martin, who played piano at the church where O'Brien was serving for an evening, and the pastor was told, "That's the original way I wrote it, so I want you to sing it this way." Maybe not all the changes were for the better but we'll muddle through it somehow.